3-D modeling, impressive looking timelines and e-books with pages you can flip, zoom or print; use these software technologies individually or combine them for even greater impact! Here is a short review of three free software products with a link to a presentation that combines all of them. SketchUp (Make) is free program that provides a lot of functionality to facilitate all kinds of designing. SketchUp can help create many different types of 3-D models. 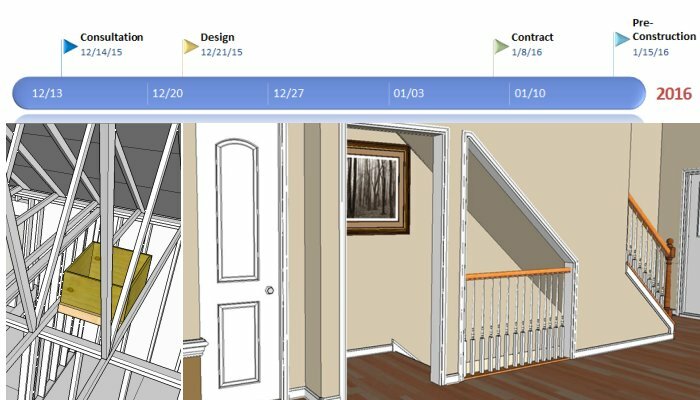 I have used it to create 3-D models of construction details, floor plans, website icons, “inventions” at home, and for clarification of “events” at project sites. The program can do a lot, and there are many resources in place to help you access all of its features. Depending on your experience level and the way you like to learn, you can make use of Video Tutorials, Self-paced Tutorials, a Getting Started Guide, Quick Reference Cards, or other Help options. Our brains work in 3-D so the difference in comprehension between a two dimensional drawing and a 3-D model is nothing but amazing. Many people who struggle understanding floor plans and blueprints instantly recognize what they are seeing in a 3-D model. Face it, project software is great for managing projects but it is not good at creating the clean looking presentations needed for executive review or client meetings. Office Timeline is a timeline maker you can add to MS PowerPoint. It is a solid productivity tool with a short learning curve. The basic version is free. Office Timeline makes it easy to create professional looking timelines and Gantt type charts for high-level presentations. With Office Timeline you can easily create outlines of key milestones and tasks, calculate task duration, track progress against the timeline and track percent complete for each task. Sending stakeholders a Microsoft Project file, Excel, or Visio file will simply be ignored by most “non” project managers involved in the project. Office Timeline helps you create clear, visual project representations that help get the attention of everyone involved. E-books, catalogs, manuals, and presentations of all kinds look better with Kindle-like animation where pages fold and turn right-to-left like a book or magazine. You can go back and forth just the way you would physically browse through a book; you can zoom into any section of the page. You can also print any page or you can print the whole book. YOUBLISHER takes a standard PDF document and makes it flappable. Just upload a PDF document and let Youblisher perform do its thing. Once finished, you be provided with several options for linking your work to your audience. There is no cost.